Germany-based music streaming service Simfy has announced that it is withdrawing its ad-supported, free-to-listen service from the Belgian market just 11 months after it launched there. In an email to users today, the company cites high music industry royalty fees for the move. 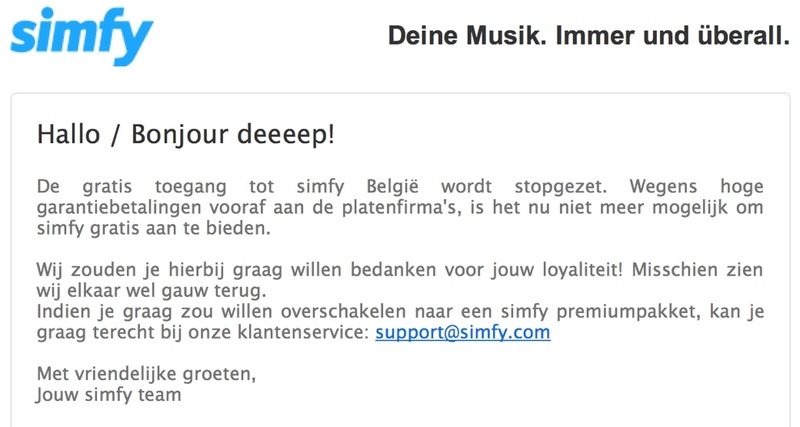 Simfy launched in Belgium in November 2011, nine days before Spotify arrived in the country. Now it appears that the company may have fallen victim to the country’s notorious royalties collection regime. We’ve previously criticised collection society SABAM for wanting to charge libraries for reading books to children. Simfy will continue to offer a subscription-based version of the service but it appears that a free version was simply too expensive to justify. It’s worth noting that its biggest rival, Spotify, currently offers a free service in Belgium, although it counts major record labels as investors, which must surely help. That said, royalty payments are a major weight on Spotify’s shoulders too. Interestingly, Simfy doesn’t mention Belgium at all on its website, now only stating that it is available in Germany, Austria, Switzerland and South Africa. We’ve reached out to Simfy for further comment and will update when we hear back from them. Thanks to Deepak Dinesh Mehta for bringing this to our attention.